Brief Overview: Mandalas can work as a form of visual journaling, boost your creativity, memory and problem solving skills, as well as provide stress relief and spiritual self-expression. Tribal Thunder makes it easy for everyone and shares the techniques to continue to create meaningful designs throughout your whole life. 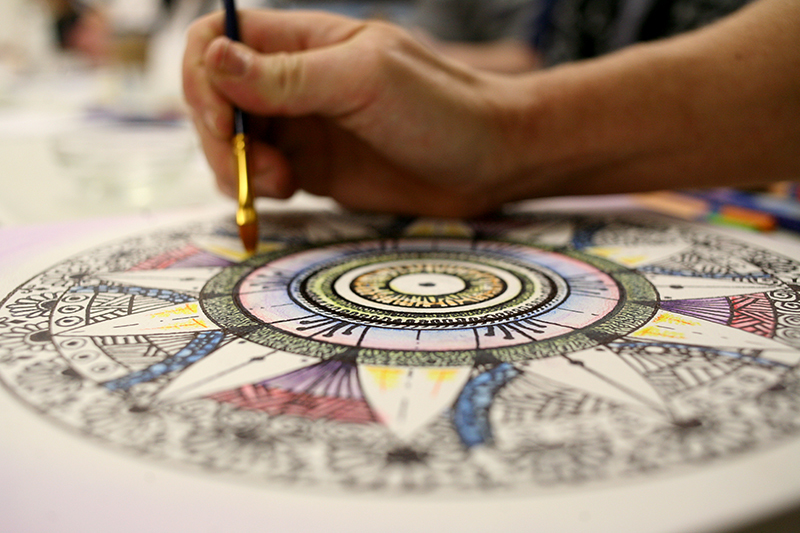 Discover the gratifying experience of making your own Mandala! Tribal Thunder makes it possible for everyone to create a Mandala they will be proud to display and reflect upon. Mandala is the Sanskrit word for Circle found in the Vedas of ancient India, dating back over 2500 years ago. Much more than just a circle, Mandala means the sacred wheel we find in so many forms around us; The Fingerprint of God. We find circles everywhere in the world we live in. From the rings of trees to the layers of an onion. Even the Earth itself is circular. Mandala’s are the essence of circle. Based on these circular layers, Mandalas can express both the inward and outward journey of life. This workshop not only offers you a beautiful work of art, it teaches you the secret techniques that allow you to continue to produce personal and meaningful designs throughout your whole life. Creating your own Mandala has surprising and profound benefits. They can be an aid to concentration, meditation, and relaxation. Mandalas can work as a form of visual journaling, boost your creativity, memory and problem solving skills, as well as provide stress relief and spiritual self-expression. They are not only powerful, they are fun and exciting! Creating a Mandala is easy for anyone, at any age. You don’t need to have special artistic talent to create meaningful and beautiful Mandalas. Tribal Thunder Mandala workshops are approximately three to four hours in duration, with plenty of time to make new friends. Groups of 12 people are preferred. All supplies are provided and everyone is guaranteed to go home with a Mandala ready to display. To book a Mandala Workshop, reserve a space, or for supplies please contact us. for you to discover, learn and explore. Please click through the pages for more detail about each of them. Feel free to contact us if you would like to sign up for a workshop/event, to request one (add to waiting list), or if you are interested in bringing one of our events to your area.